Over the years we have seen some agates from here on the coast resembling blue to a point but this one has them all beat. This just happens to be of the finest color wise comparable only to some of the best Holley Blue agate also found here in Oregon. Ken is one lucky dude that gets to spend his lunch hour beachcombing for agates on the Oregon Coast anywhere from Astoria to Brookings. We are now enjoying the rewards of the minus tides of spring here at the coast. Here is a photo of just a few of the treasures David of Salem found here in the Newport area beach combing with his family. Editors Note: Upper left photo- possibly a blue agate, upper right possibly a lavender agate but all are beautiful pieces. Beachcombers Rusty & Lesia, of Bozeman, Montana were fast on their feet to find this beautiful bright green 12 inch Japanese glass fishing float. They were one of two couples that discovered this rare treasure at the same time. This float is still complete with the fisherman's net or rope still attached and covered with barnacles to boot. We tried to move the barnacles aside to see if the fisherman's stamped logo was visible but no luck, the barnacles were too tightly entwined. The low tides of spring have blessed the beachcombers with many treasures this spring. We are in the midst of 6 weeks of spring break here on the Oregon Coast. Local beachcomber Lisa, just found these beautiful trophies and a whole lot more than the camera could hold today. Upper left shows some of her fossils, the largest fossil is about 1/3 of a Musashia indurata shell, and various other shell fossils (I threw a quarter in the photo just for scale). The lower left shows some nice petrified wood scattered in among the agates. 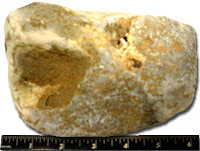 Agate found on the central Oregon coast, this 3½ pound agate was just found by Newport residents Greg & Cheryl, it has yet to be cleaned more but upon close inspection it appears to be ice blue in color. During your beach walks this spring, should you happen upon an elephant seal breathing hard, missing patches of hair and spotted with sores, don't worry. The critter's not dying; it just looks that way. Now is the time of year when elephant seals begin to come ashore to molt, said Keith Chandler, director of the Seaside Aquarium, and they're not a pretty sight. 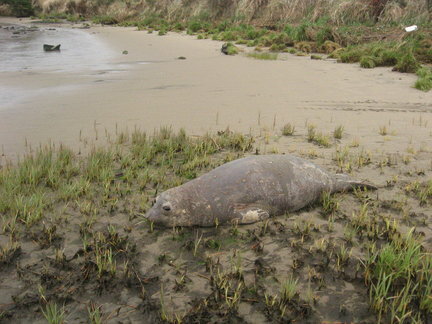 March through June (peaks in May) is Harbor seal pup time along the Oregon Coast and beachcombers are likely to see them. The pups may look stranded but they are supposed to be there and they should not be touched. The mothers will not come to shore to feed them if humans are nearby and the pups can be easily separated from the mothers.